Like we're not already in recession. 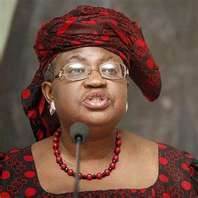 Dr Ngozi Okonjo-Iweala, on Wednesday, urged ministers to seat up in anticipation of a recession following the economic problems being experienced in Spain, Greece and other European countries. The Minister of Information, Mr Labaran Maku, who disclosed this to State House correspondents, said she gave the warning at Wednesday's meeting of the Federal Executive Council (FEC). Maku, however, allayed fears that the nation was broke following the delay in the payment of salaries, saying that it was caused by the e-payment being embarked upon by the Federal Government. Big deal, ain't we already in a recession? dont mind herb o, my thoughts exactly! so we should expect worse than this crappy economy we already have.